Scott Smith has targeted a regular place in the Hibernian first team after being handed a new one-year contract. The 20-year-old left back has made one appearance for the senior side, as a substitute in a League Cup victory over Berwick Rangers. 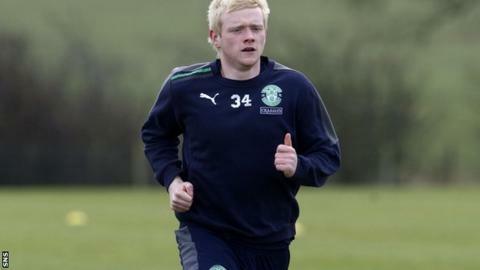 "Hopefully then I can catch the manager's eye," he told Hibs' website. "And, if I get presented with an opportunity, I can take it with both hands. It's a challenge that I'm excited about." Smith made 12 appearances for Brechin City after being farmed out to the Second Division outfit in August. "Last season was a step-up from playing for the under-19s and it was a good experience," he said. "I also learned a lot from going out on loan to Brechin and playing regular first-team football, which was definitely beneficial." Hibs manager Pat Fenlon is hoping Smith can build on the experience he gained at Glebe Park and make an impact at Easter Road. "Scott has been in and around the first team for a year now and he has got a fantastic attitude and wants to succeed," he said. "He fits in with the type of player we want at the club moving forward."